Meet an entrepreneur helping us feel safer! We talked to Richard Kay, co-founder and CTO at Chaperhome, he is an entrepreneur with the aim of helping us feel safer! We met Richard as he took part of our Empowering Futures programme last year. Richard was about to launch ChaperHome and we introduced him to Christina Wood, a marketing student from the University of Greenwich looking to collaborate with a start-up and gain marketing experience. They both had a positive collaboration experience and we thought ChaperHome represents how people support and take care of each other and we want you to know about them too. ChaperHome is a simple mobile app, but it could save the life of someone you love – or your own. Based on research and user feedback, ChaperHome is a safety companion, connecting you to a network of ‘protectors’ – your friends and family. You can easily set up scenarios and the app will send a notification to your loved ones as soon as it registers something going wrong, or if you arrive safely. The point is that it will happen without any input from you. In a situation where you might not have time for more than a single tap, ChaperHome has your back. 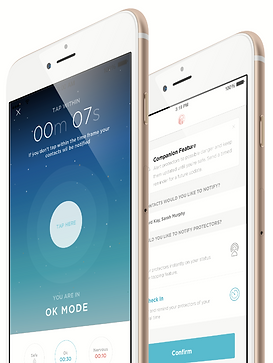 The app is perfect for parents worried about their children, as well as students and young professionals who move to a new city and could use a little help to feel completely safe. How did you come with the idea of ChaperHome? The idea came to me during a conversation with my girlfriend, we both realised that there was a lack of really useful mobile safety apps. The kind of apps people can rely on when heading home after a party late at night – or heading home in general. We tried several of the available products and found out that they were very focused on user input and only one scenario. That wasn’t really helpful or safe. In the scenarios envisioned by the creators of those apps, the user needs to send out a call to action. Imagine being mugged. Even if you’re not separated from your phone, you might be unable to call for help yourself. This needs to happen automatically. I wanted to build something simple and modern – an app that would really help people stay safe. I talked to many people and found out they often felt nervous about living in the city. A little extra reassurance could really help them. ChaperHome is a tool to help people stay more aware of everything around them and enhance their personal security with little effort or cost. You can set messaging alerts as reminders for your protectors to check up on you at particular times or intervals. This way, they will know that something isn’t right without you having to do anything in real time other than react to their calls or messages. The pre-setups work like this: you have a plan that involves going from one location to another. If something goes wrong, like if you don’t make it to your destination, alerts are sent to your protectors. If all goes according to plan, however, your protectors get the expected messages confirming your safe arrival. Does it mean ChaperHome tracks the user’s location? We’re not like Google Maps, tracking the user’s location at all times. We know people who highly value their privacy might be against such a functionality and wouldn’t want to discourage them from using the app. Aside from that, GPS tracking is a great strain on a phone’s battery. ChaperHome limits the location tracking while everything is fine, but if something goes wrong, the protectors get informed about it and receive your device’s location. They can call you, since they have your number stored, and then they will receive live snapshots of your location every 10 seconds. Finally, the groups feature is useful when you go out with a bunch of people. You can select particular protectors and customise messages, which you can then send with just a tap. What kind of change are you bringing into your users’ lives? Of all the great feedback we’ve had, the most satisfying are all the different applications of the features we’ve built. We envisioned the Companion as a tool for walking home safely, tapping your phone every 30 seconds. After talking with care professionals, we found out that tapping every 30 minutes would be great for house calls. Real estate agents tend to be away from family and colleagues for large chunks of time. They might become involved in an accident or get locked in a closet. ChaperHome would be a wonderful solution for them, too. What do we need to make ChaperHome our companion? It is a community driven thing – people are going to share ChaperHome with friends and family, it is meant to make us feel safer but we all have to contribute by inviting the closest people to us to download the app as well and keep an eye in case something unexpected happens.